What to say? Words whirling around, no where to land. Emotions swirling, not one sticking for very long. Crying one minute, laughing the next. What do we do with grief so great? When it is not even grief of our own, but of a place we’ve never even been? Only it feels like we have been there. Every teacher I know feels they know that place and wondered “what if” on Friday, as they hugged each student good-bye. Every Mama and Daddy, we hurt so deeply, eyes filling each time we glance at the little hands we still get to hold. Grandmas and grandpas, relatives of all sort. It feels like it’s not far from home, doesn’t it? Some try to argue it out. Blame someone. Our laws, politicians. It’s their fault, right? Or God. He could have stopped this. It’s what we do. We try to figure out what went wrong, try to make sense of it all. The truth is, we just can’t. Not like that. Blaming politicians or gun laws isn’t going to get us anywhere. Blaming God sometimes feels productive, like you have finally found the source of the problem, at least that’s what it was like for me. I spent plenty of days months and even years blaming God for a tragedy I’ve experienced. While the anger felt correctly placed at the time, it only served to stir up more anger, more frustration, more hate. I’ve learned from my own tragedy – while very different and of a much smaller scale than what we all heard of on Friday – that blaming God gets you nowhere, because it is anger placed in the exact wrong spot. Hate directed at a source that only gives Love. I’ve learned that no matter how much hate is poured out, His Love pours out infinitely more. I’ve learned that tragedy, tremendous tragedy and evil exist. But so does God. And He is Love. He will never abandon nor forsake us. He loves deeply. He knows our hurt, and He weeps with us. I’ve learned that on a day like today, when the grief bubbles over and runs down your face at a moment’s notice, there isn’t much to do except pray. And that is no small thing. I’ve learned that on any day, on every day, we need to soak up the moments. Not let them slip past. Not take them for granted. I’ve also learned that on any day, when the frustrations of being a Mama are great and the bedtimes are later than they should be and the kids say words they shouldn’t in tones they shouldn’t and I do the same, that it is ok. That I don’t need to feel guilty for letting a moment slip by and not loving every second, because day-to-day life is just hard sometimes. And frustration from the day and longing for the kids to be asleep doesn’t mean I love them less or that I don’t know how incredibly blessed I am. When I wish for no more diapers or for a moment alone, it does not mean I’m taking my moments for granted. I’ve learned that in our hardest moments, when we have no words to say, when hurt runs so deep that it grips the heart and soul and stills the tongue, that Jesus, the son of God, prays for us. Jesus, the Son of God intercedes on our behalf. On behalf of those mommies, daddies, and all that are hurting. When our words run out or won’t come, or when they whirl around with no place to land, the King of Kings, sitting at the right hand of the Father, prays for us. And when Jesus, God the son, prays to God the Father, he can only pray the perfect prayer, exactly what needs to be said and exactly what needs to be done. Most importantly, I’ve learned that Jesus is our only hope. He is the joy of more than just this Christmas season. He is the Hope of my heart. The hope of Oregon. The hope of Newtown, CT. The Hope of the nations, and of this world. He is the only hope. When the pain of life seems greater than we can bear, Jesus comforts. Jesus heals. When we think we can not go on, He sustains. When all around seems to crumble, He is steadfast, a solid rock. Some blame Him for the heinous acts that have occurred in our country, yet His Love is limitless for even them. I wonder, do we also praise Him when we see blessings poured out? Or does He get ignored until the next tragedy, where we can dump further blame on Him? Do you know this Hope? This Hope that is Limitless Love? This Joy, that is found not in the packages under a tree, but that was nailed to a tree? This Joy to the world, that He has come to bring a Hope of life eternal? Do you still wonder, why didn’t God stop it? Why didn’t He stop the evil that is beyond our comprehension? And while we’re on the subject, why didn’t He prevent every other pain in this world – big and small – if He really truly loves so much? That’s okay to wonder. He understands that, too. It doesn’t all make sense to us, but we must know the whole story. With the very words that He spoke, God created everything. By His very breath, Adam’s heart not only began to beat, but his mind began to think and his soul was connected to God. “And God saw everything that He had made and it was very good.” Adam and Eve enjoyed an astounding relationship with God. Fully secure. Fully accepted. Fully significant. Wow. To sit down and try to wrap our heads around this is mind blowing. While I won’t get into the specifics of what we Christians call “The Fall”, I’ll just plainly state that Adam and Eve sinned. They did what God told them not to do and when they did that, the connection that they had with God was broken. They died. Not physically…yet. But they were spiritually dead. Any every person born from them and after them would be spiritually dead too. Now, let’s just be real for a minute. If it wasn’t Adam and Eve, it would have been you and me. Let’s not forget that their sin did not catch God off guard. It’s not like He had to come up with His plan in the middle of the night while Adam and Eve were huddled behind a palm tree sewing their fig leaves together because they were ashamed in their nakedness. God is omniscient. He knows everything. If He knew “before the foundations of the earth” that I would be His little girl, then He knew before He ever began to stir up the dust to make Adam that I would need to be redeemed. Therefore, God had His plan set from the beginning. Because He loves me. Because He loves you. Because He is Love. His plan unfolds in every page of Scripture and is so clearly stated in Genesis 3. We had a problem. God loves us. God wants us. God is Holy, He is not stained by sin nor will He accept any stain into His Kingdom. We were all born stained. We are all born spiritually disconnected. We cannot do anything about it. We have a problem. The Good News or “Gospel” as we call it, was first proclaimed by God Himself in Genesis 3:15. “I will put enmity between you and the woman and between your offspring and her offspring; he shall bruise your head and you shall bruise his heel.” God said that One would come who would deal a crushing, disarming and deadly blow to satan. All of the Old Testament points to the death, resurrection and ascension of Jesus Christ. The plan is to give us back what we lost. To give us back our LIFE. Not physical life, spiritual life. The plan is to reconnect us to God. In order to do that, God had to remove our stains, our sin had to be paid for. So He took His Son Jesus, wrapped Him up in human flesh and sent Him to earth…because He loved the world. And God brought Jesus back to life. …is clean and connected to God. There is not another one. This is the Beginning and the End of the World. Now, in light of yesterday’s tragedy, people ask where God was…or maybe the question is better put, “what is God’s plan in that?” We are upset because God, who could have stopped this…didn’t. Perhaps we are not all that different then, from those awaiting a Savior in the New Testament times. He was rejected by some perhaps because He did not come the way they thought He should. Perhaps they thought the Savior would come and disarm the Roman rule and set Israel free from its oppressors. Wouldn’t a Savior stop the shooter? We get so caught up in what we can see with our eyes, what we feel with our emotions, but God told us that it is by grace through faith that we are made alive. Our oppressors include the world, our own human nature and the devil…and on the cross, Jesus disarmed them all. The plan WAS fulfilled, IS BEING fulfilled and WILL BE fulfilled. He paid for my sin and set me free. This life I live, I live by faith in Jesus Christ. According to my calculations, today is supposed to be day 34 of my “40 days of Faith, Family, and Funnies.” I’m just a wee-bit behind. But c’mon. Did any of you think I’d actually complete 40 consecutive days of blogging? 7 days was a stretch, and frankly, it wasn’t even fun at that point. Life gets busy and time is always short. I did manage to squeeze in an 8th post about Jacob and his “boy tights,” making my goal 1/5 of a success. And I’d say 1/5 success is better than no success at all. (Like that positive spin?) I was only short a mere 32 posts, and really, now that I’m almost… well, let’s just say I’m older than 32…, 32 seems like such a small number. But since my goal was 40, and since the reason I started this challenge in the first place was to focus on the things I am most thankful for (Faith, Family, Funnies… and Friends), I decided I’d catch up in one random blog post. So, below you’ll find a list of 32 randoms… mostly within those categories. Some other topics may have snuck their way in, too. 1. First, a boy-tights update. For those of you that were so very concerned about my poor son and his undergarments, I saw boxes of long-johns at Costco. While I admit I quickly became that annoying shopper (according to my husband) who looks through all 6 bins (moving each one out of the way) to find the right size, I did so in a less-crowded Costco (Burlington) and without blocking the entire aisle or neighboring products. I also completed the hunt with incessant grumbling from the Husband. But here’s the deal: you don’t get to grumble about your son having to wear boy-tights and also grumble about your wife taking the time to look for long-john replacements of the correct size. It’s one or the other, Buddy. Alas, there was not even one box left in all 6 bins that would fit, so boy-tights it is. Jacob doesn’t seem to mind. In fact, he asked to wear boy tights just the other day. 2. The kids got to spend a day Christmas-crafting with my aunt, uncle, and my cousins’ kids. They were SUPER excited about it and had a total blast. Later that night when we were back home, Annalise said to me, “I had so much fun today! I wish I could stay at Auntie Jill’s for 100 years… I would do it, except you would be dead when I got back. So I guess I won’t.” Nice to know she loves me enough to want to see me at least once before I’m dead. 3. While having a little fun with Jacob, I may have given him the impression he has magic powers that can cause doors to open and close at his command. The van door opens with the push of a button on the key fob, so when he was frustrated at not being able to pull it open I playfully told him, “Just tell the door to open.” He did. I pushed the button. The door opened. I really didn’t intend on it going much further, except that now he enjoys telling the van door to open and close often, and it works every time. Or at least when I’m in earshot and have the fob in my hand. There have even been a few times where he’s headed out to the car first and I hear him yelling at the door to open while I’m still inside locking up. He stops yelling commands to the door, pauses, and changes his tone to his sweetest voice, “Door, could you please open for me?” I quick grab the fob and push the button. You know, just to reinforce the whole good-manners thing. Well…. It’s all fun and games until you find yourself standing outside of Rite Aid trying to get your 2-year-old to the car, only to discover he is standing in front of the automatic doors, totally hollering at them in complete frustration to CLOSE! CLOSE, DOORS, WIGHT NOW! Only they won’t close… because, as I already said, he is standing in front of them. Ah well. At least his sister got a kick out of it. And we entertained a few customers in the process. 4. Today, Annalise spent some time being grumpy with a capital G. I had totally lost patience and was at my wits end trying to think of what to do with her besides lock her in her room forever when Jacob suddenly ran over to her, pulled at her sleeve as though he had just grabbed a loose hair off it, and ran towards the kitchen. I had no idea what he was doing until I heard the cupboard door under the sink slam shut as he hollers toward the living room, “Don’t worry, Sissy! I just took all your grumpies from you. And I FREW dem wight in da garbage! NO more grumpies!” Matt and I looked at each other in amazement and started to laugh hysterically. We had no idea where that came from. His own idea, I guess. He took those grumpies right off her sleeve and ran straight towards the garbage with ’em! I guess he’d had enough, too. And there you have it, folks. The (already) grumpy girl found a way to blame her brother on her grumpies. It is his fault, of course, because he threw away the wrong thing. If you’re missing your own happies, you might want to check the garbage can. Well, that’s it for “Catching up.” Yes, it’s only 4 stories. Did I say 32? That may have been over-estimating my time to sit and write (not to mention everyone else’s interest level.) So I think I’ll stick with four and call it good. May you have a merry Christmas season full of kids who love you enough to want to see you (at least once), magic doors, and grumpies in the garbage. Really no desire to write tonight. It’s been a day. Let me tell ya, it’s. been. a. DAY. But that would be awfully sad if I set out to do 40 days of posts and could only make it 4. I’ve got to at least make it a quarter of the way, wouldn’t you say? So… Day 5 of 40 Topic: Funnies? Maybe. I still haven’t made it on Annalise’s Thanks Giving leaves. She was wondering out loud what she’d write on her leaf for the night. My heart is thankful she is thankful for so many things that she just can’t pick one. We are blessed! Aaaand most of her “thankful” things have been people. The girl values what’s important. Double blessed! But the decision each night is a tough one and takes some pre-planning. Leesie: Mom, I just don’t know what to write on my leaf tonight. I’m just thankful for so much! (pause) Oh, I know! I’ll be thankful for Izzy! Me: You already were thankful for Izzy. L: Oh. (another pause) How about Jacob? Me: Yep. You were thankful for him, too. Me: (disgruntled) Yep. Him, too. L: Hmm. Well, I can’t decide then. Me: I can think of someone you could write. L: (with surprise. As though there couldn’t possibly be another person to write) Who??? Me: Yeah, I remember. But then you said Daddy, Izzy, and Jacob separately. And you were going to say them all again. L: Yeah, but I can still be thankful for it all year! Right, mom? I’m getting beat out by a pink tree. 20 days left (not that I’m counting). I could still make the list, but it’s not looking good. Do you ever have one of those moments where you think of something that is just so awesome you can’t wait to tell someone? In your mind you build up that moment when you will share it with them, imagining they are so in awe of your awesome idea and your awesomeness in general? No? That’s only happened to me? Hmm. Well, it was kind of me at the beginning of this month. I had this idea that – while not necessarily super awesome or unique – I thought was rather clever. And I was quite proud and excited to share it. I am not so brilliant that this is a brand-new idea. I’m sure thousands of people have done it or something similar. In fact, I know 1,000’s of people have done it before, because I Googled it just now. Lots of people have done it. And way better than I did. Why is it I want people to think I had such an awesome idea? Am I so proud that I want to be noticed and applauded for an idea or accomplishment? This verse came to mind: “Woe to those who are wise in their own eyes and clever in their own sight.” ~ Isaiah 5:21 Ouch. My “clever” idea was just a fun way to remind my kids (and Matt and I) to be thankful each day for the blessings God has provided, to remind us of HIS providence. I was proud of my idea that was meant to keep us grateful and humble. Oh, the irony. Paul goes on (verses 22-24, emphasis my own): For in my inner being I delight in God’s law; but I see another law at work in me, waging war against the law of my mind and making me a prisoner of the law of sin at work within me. What a wretched man I am! Who will rescue me from this body that is subject to death? But we can’t stop there. Because the next verse, and the first few verses in chapter 8, are the promises of God, the Hope Jesus gives: Thanks be to God, who delivers me through Jesus Christ our Lord! Therefore, there is now no condemnation for those who are in Christ Jesus, because through Christ Jesus the law of the Spirit who gives life has set you free from the law of sin and death. I’ve written my favorite analogy for this in my Bible next to those verses. (The analogy is not my own, but one I heard first in a sermon, then later in a Freedom in Christ course): The Law of Sin is like the Law of Gravity. Always there. Always pulling us down. But how do overcome such a law? Through a greater law. For gravity, a greater law is the Law of Aerodynamics. For sin, it is the Law of the Spirit. Yep. Always there. Always pulling me down. How thankful I am for the hope of Jesus. Who gives life and has set me free from the law of sin and death. Thankful. Which brings me to my “clever” idea. Which 1,000’s of people have already thought of. And which a famous author (Ann Voskamp) already posted just this morning. Only hers is way better than mine. And so is her blog post about the idea. 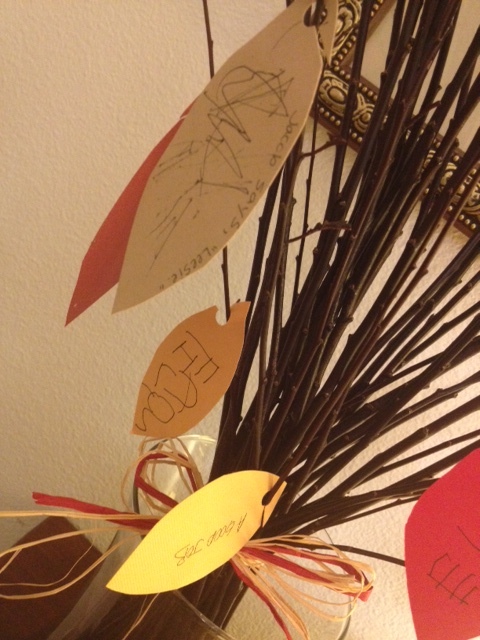 This is our family’s Thanks Giving Tree (in a blurry pic): Each night in the month of November, we each say something we’re thankful for, write it on a leaf, and hang it on our tree. 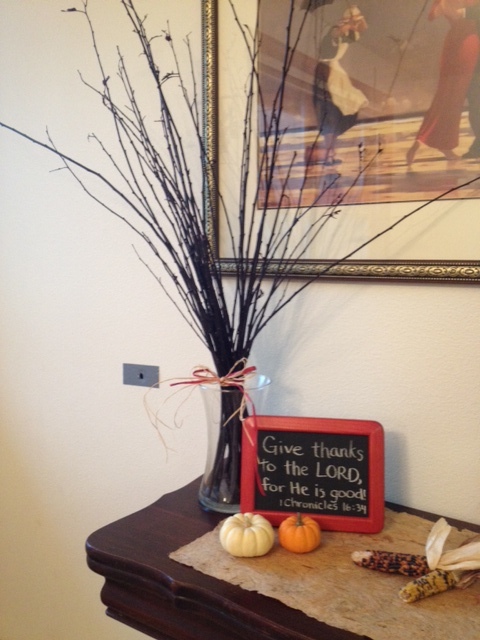 We put 1 Chronicles 16:34 next to the tree so we remember to whom we should direct our thanks. Give thanks to the LORD, for He is good! 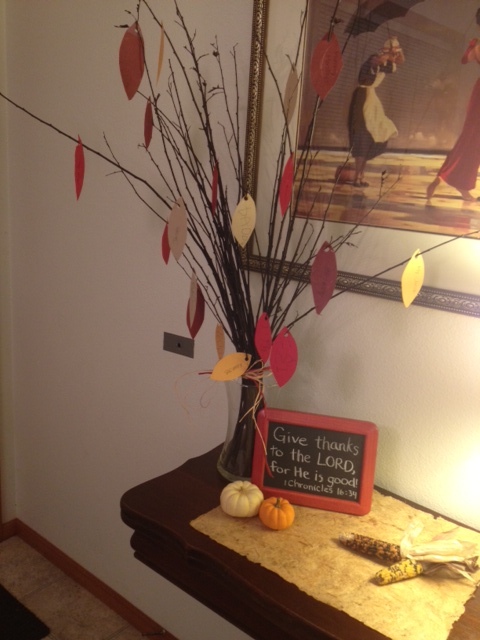 Then after hanging the leaves, we thank the Lord for those things we’ve just written. Annalise is learning to write, so it has been especially fun watching her excitement (most nights) writing her own letters, and sometimes even Jacob’s. Other times, Jacob “writes” his own, with a translation from Mommy. Not that I’m keeping track or anything, but Annalise’s first 7 leaves seem to be missing a certain member of her family. So far, she’s been thankful for: 1. Family, 2. Izzy (the dog), 3. Daddy, 4. Jacob. Then she “couldn’t decide between Ellia and Auntie Kye-Kye.” So she picked Ellia first (#5) and “would do Kye-Kye the next night.” Except the next night she forgot and put “my bed.” At least Kye-Kye was considered. Her #7 thing she is thankful for is “Thanksgiving.” I still have 23 days to make the list… Not that I’m keeping track or anything. My #7 thankful thing? Freedom in Christ. Not the class (although I’m thankful for that, too), but the actual freedom. I don’t have to be “good enough.” I don’t have to “work hard enough.” I can walk freely, a child of God, drawing closer to Him, without guilt, doubt, and worry that I won’t measure up. I don’t have to win the battle over sin, because Jesus has already done that for me. Thanks be to God. Oh yes, and since Ann Voskamp did the Thanks Giving Tree much better than I did, here is a link to her blog post about it. 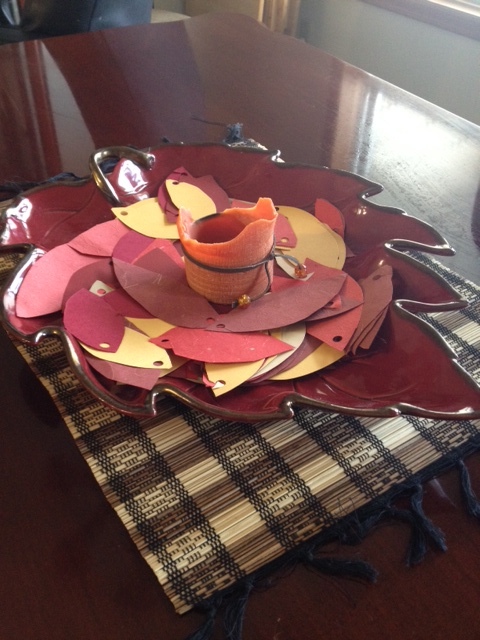 I just cut out plain leaves from fall colored and textured paper. She actually has a printout with verses of thanksgiving on the back, and you write what you’re thankful for on the front. Genius. 2 of 40 – Halloween Costumes! 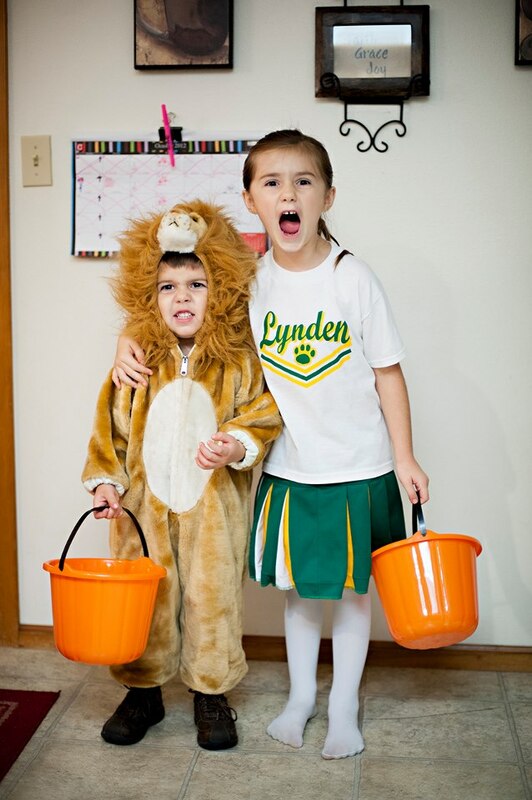 Yes, that is a Lynden Lion and a Lynden Cheerleader. And yes, they are roaring. Like I said, Ferndale folks… I’m sorry. He wanted to be a lion. She wanted to be the princess from Brave. I didn’t want to spend $50 on costumes. My favorite consignment store had the lion costume for a couple bucks. She already had the cheerleader costume and was satisfied. Therefore…Nearly Free Halloween Costumes > Alma Mater Loyalty. It just is. P.S. I love that right now, as the presidential race results are being televised, my kids are in their room singing at the top of their lungs, “Our God is a GREAT BIG GOD. Our God is a GREAT BIG GOD! Our God is a GREAT BIG GOD, and He HOLDS US IN HIS HANDS!” Thankful for them. Thankful for HIM. Thankful HE is in charge, no matter who is president.